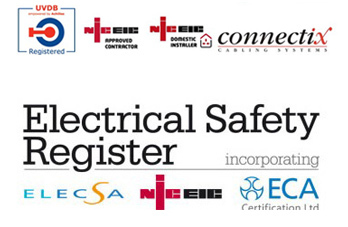 NSE(Wales)LTD has a team of fully qualified Electrical technicians trained to City & Guilds 2394 & 2395 (new for 2012 replaces City & Guilds 2391-10) which include Level 3 Certificate in Initial Verification and Certification of Electrical Installations AND Level 3 Certificate in Periodic Inspection, Testing and Certification of Electrical Installations and City & Guilds 2377 – Code of Practice for In-service Inspection and Testing of Electrical Equipment (PAT Testing) Level 3. At NSE(Wales)LTD we can provide you with the Initial verification of your new electrical installation providing we have undertaken the installation in house, or for existing electrical installations we can supply you with competitive prices for the electrical condition report. For domestic installations we would recommend an electrical condition report carried out every 5 years or 3 years if it is a rental property. PAT testing (Portable appliance testing) is the examination of electrical appliances and equipment to ensure they are safe to use. This service is essential for landlords or business owners . The Government has put regulations into place that pertain to the maintenance of electrical appliances and the most effective way to ensure that these regulations are met is through PAT testing. The UK Health and Safety Executive along with insurance companies will expect you to perform PAT testing to ensure that you are compliant with certain regulations such as Health and Safety at Work Act of 1974 and The Electricity at Work Regulations of 1989.